Introducing Livorsi Marine's New QR Series™ Throttles (Quick Response) designed specifically for Mercury Marine's DTS compatible engines. The shorter levers make this control great for tight dash spaces and allows for quicker response time. These ergonomically designed knobs are very comfortable on the palm of your hand. With up to 3 trim switches integrated into the knob, your hand never has to leave the control. Electronic shifting and throttle make it easier to maneuver in tight docking spaces. Create your own color combination to make this control look and feel like a custom built control. 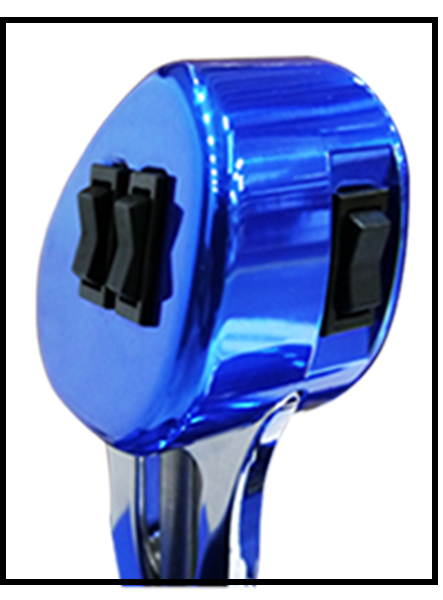 Livorsi's unique chrome process provides added layers of protection that make this billet QR Series control impervious to salt water corrosion. Trim switch wires are integrated into the handle ( No exposed tube). Base plate has no screw holes exposed for a clean hi-tech look. Available in single, twin and Shadow Mode configurations. Shadow Mode allows a 4 handle control (2 shift levers 2 throttle levers) to run up to 4 engines with an optional Mercury dash pad. DTS Controls work on Mercury and Cummins DTS ready engines. Easy adjustments for friction and detent. No need to remove the control to adjust. Please call Mercury Marine for Rigging Kits. .
Livorsi can provide you with a contact for a Mercury Certified Dealer in your area, please call 847.752.2700.